Mark Wallinger is a British artist whose most famous works are Ecce Homo and State Britain. He was born in Chigwell, a town located in Essex and educated at the Londoner Chelsea School of Art. After his studies he became a tutor at Goldsmiths College and started to exhibit his own art in the 1980s. Through his work he emphasizes social class, royalty and nationalism. He has done a lot of paintings but since the 1990s he started using new techniques, for example sculpture for Ecce Homo. In 1995 he was nominated for the Turner Prize, which is a prize awarded to a British visual artist by the Tate gallery. His A Real Work of Art, a racehorse that he bought in order to compete in races, contributed to this nomination. Concerning his later work, Wallinger turned to new preoccupations, mainly religion, death, myths and was influenced by William Blake. He is currently working on a piece based on Titian’s work together with two fellow artists in collaboration with the Royal Ballet and the National Gallery. Two pieces stand out in his whole career, namely Ecce Homo and State Britain. Firstly, Ecce Homo was the inaugural work of art to occupy the 4th plinth of Trafalgar Square back in 1999. This plinth was originally dedicated to an equestrian statue but due to a lack of funds the project was abandoned and it is now used to display temporary works of art. Wallinger’s statue represents a life-sized Christ and refers to Ponce Pilate’s words “Behold the man” as Jesus was presented to the crowd before his crucifixion. The man is almost naked, shaven-headed, crowned with barbed-wire and his hands are tied in his back. The statue was created with a modern process consisting of marble dust being fixed into resin. Even though this method permits to reach almost perfect realism, Wallinger preferred to reduce and edit Ecce Homo’s detail. His smallness and pallor compared to the three giant bronze statues adorning the other plinths and his position at the very edge of the support convey uncertainty, vulnerability and introspection. The work itself echoes questions about symbolic value, placement, private belief and public statement. It is thus important not to see Ecce Homo as a self-contained artwork but to take the setting into account as well as the debates and feelings it sparks. Secondly, with State Britain, Wallinger moves away from painting and turns to installation art. 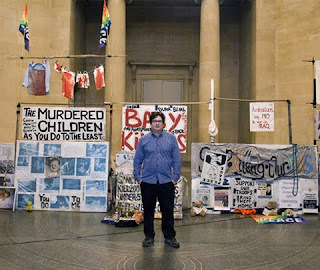 It was exhibited in Tate Britain in 2007 and is a reproduction of the famous protest set up by Brian Haw in Parliament Square against the decisions taken concerning Iraq in 2001. Most of the demonstration was removed because the man was protesting in an unauthorised area, which prompted strong reactions within the public. To mock the law prohibiting such protest within a radius of one kilometre around the Parliament, Wallinger drew a line corresponding to this limit throughout the galleries of Tate Britain. Via his exhibition, Wallinger deals with questions such as freedom of expression or civil liberties in Britain. His political commitment was reinforced by a faithful rendering of the protest. For instance, he reproduced original banners and displayed teddy bears with peace slogans. This work enabled him to be nominated and to win the Turner Prize in 2007.